Classic Shell • View topic - Microsoft Windows 10 (B1607) Anniversary Update Clock? Post subject: Microsoft Windows 10 (B1607) Anniversary Update Clock? 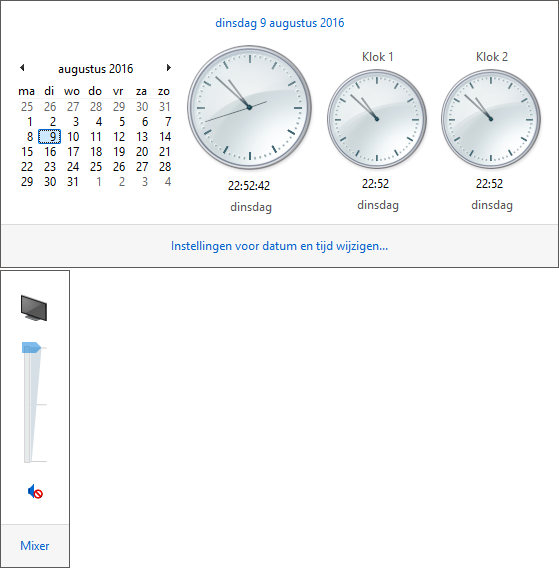 I don't know if you know but into the Latest version from Microsoft Windows 10 they Removed the Clock Support. So I was wondering if you can bring it back to us, why do I ask it here because you're software provide software to return from the Old Layout to the New Layout. So I was hoping you can make this for us, also Volume does still work only the question is for how long maybe you can add this aswel into the future into Classic Shell. You can get old clock layout using the registry editor. Click on the Immersiveshell folder on your left hand side. Following that, create a new DWORD (32-bit) Value in your right hand side. Name it UseWin32TrayClockExperience. By default, the value would be 0. You have to set the value to 1. To change the value, double-click on UseWin32TrayClockExperience and enter 1 before saving your change. What I don't like about the new calendar/date/time pane is that the analog clocks are gone and the calendar control is ruined. You could scroll exactly 1 month using the mouse scroll wheel. Now in Windows 10 Anniversary Update, it is a freely scrolling control. 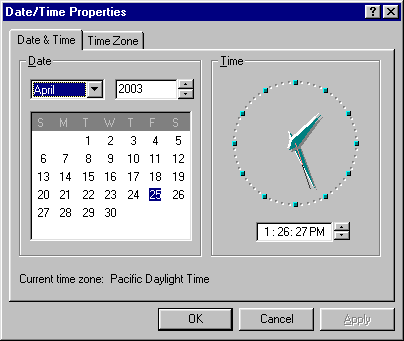 I’m also very sad about the loss of the good old tray calendar with the analog clock from Win 7. It’s definitively not possible anymore to bring the analog clock back with the registry-record, which »grisha22« has posted, and »Gaurav« has linked the right information about it, why. Could this issue not be a typical task for the Classic Shell Menu developers? The possibility, to change the colour of the taskbar since Version 4.3.0, was great, now the return of the good old tray calendar from Win 7 could be a next goal. classic shell tends to stay largely focused on the start menu, though it has recently wandered into the realm of the taskbar, those changes are largely cosmetic. If the old clock program still exist somewhere, and IVO stumbles on a simple/safe way to 'toggle' it, then he may include such a feature, however, I doubt he is specifically looking for such a way, even if it does exist. It was introduced in Win95 and remained into Windows 8.1. Nadella is killing everything that defined Windows. For now we can only open timedate.cpl and press change date and time to look up the date however ivo should add this to the taskbar clock itself . On the topic of classic clocks, perhaps the clock can be a added extenion of the taskbar done in a similar way as the classic start menu program does [basically instead of replacing it with the windows 7 style clock, simply have it run 'over' it [or however it is that classic shell start menu works]. Basically it would probably be called 'classic clock' or 'classic time/date' and would have similar theme-ability as what the start menu and/or taskbar currently have in classic shell. Not sure how it would be coded but it might be a possible solution. And as for my request, this one is more towards the forums than the actual program.. I was wondering what your guys' thought would be towards possibly adding a reputation system to the forum [possibly via a like/dislike system or something like that]. I've noticed a lot of the forums I've seen use them but this one doesn't seem to have one. Any thoughts on possibly looking into adding something like that to the Classic Shell forums? @Nimbi, in most of the forums I attend, there are "senior members" or "sages" for that purpose, usually also the number of posts of a member, could in some ways tell if it's worth to follow his suggestions. This tip is recycled in many posts that address the same issue, but somehow - following the guide(s) to the letter - it doesn't work for me. I use Windows 10 Pro, winver reports [1607 (OS-version 14393.1358)].